This is the second book in Cher Griffin’s Marla Mesconti Mystery Series. 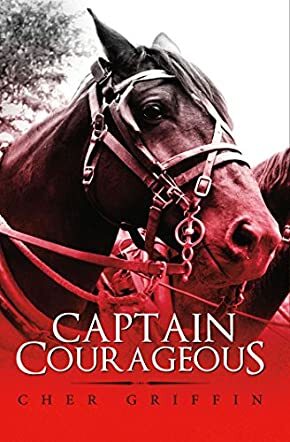 Captain Courageous has all the makings of a page-turning mystery thriller, plus the added bonus of a horse theme. There are lots of interesting tidbits about horse trading, rules and regulations in the horse industry, horse ailments and, on the more positive side, horse training, riding and showing. This is definitely a horse lover’s book of choice. As the plot thickens, Marla, horse trainer and riding instructor, shows her knowledge of horses and the horse world, and helps unravel the mystery of who really did murder the lecherous scumbag thief, Gus. A good read.